British Idealist F. H. Bradley (1846-1924) was one of the most distinguished and influential philosophers of his time. He made contributions to metaphysics, moral philosophy and the philosophy of logic. The author of Appearance and Reality (1893), a classic in metaphysics (also reissued in this series), he rejected pluralism and realism. 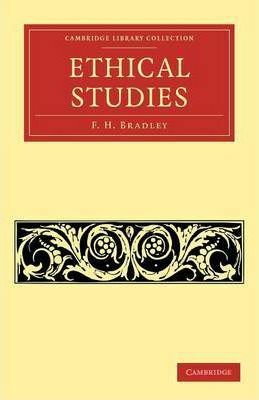 In this polemic, first published in 1876, Bradley argues against the dominant ethical theories of his time. Essays in this book entitled 'Pleasure for Pleasure's Sake' and 'Duty for Duty's Sake' examine and criticise hedonistic utilitarianism and Kantian ethics respectively. Bradley disagreed with individualism, and in 'My Station and its Duties' he discusses the idea that self-realisation can only be found as part of the social organism. This is a classic ethical work that will be valuable both to those studying the ethical theories discussed, and to those interested in the history of philosophy. Preface; 1. The vulgar notion of responsibility in connection with the theories of free-will and necessity; 2. Why should I be moral? ; 3. Pleasure for pleasure's sake; 4. Duty for duty's sake; 5. My station and its duties; 6. Ideal morality; 7. Selfishness and self-sacrifice; Concluding remarks.